Yet another of my wanderings around Prague by tram took me on route 20 to Podbab, where I found an astonishing Crowne Plaza Hotel which I considered couldn’t possibly have been built as a hotel. Sure enough, it turns out to be a defence-ministry building, the creation of the very powerful Stalinist Minister of Defence, Alexej Čepička (1910-1990) who, if his Wikipedia entry is to be believed [http://en.wikipedia.org/wiki/Alexej_%C4%8Cepi%C4%8Dka], came straight from Central Casting. According to Wikipedia, its nuclear shelter for 600 people is now the staff cloakroom. Though the hotel website [http://www.ichotelsgroup.com/crowneplaza/hotels/us/en/prague/prgcs/hoteldetail?cm_mmc=mdpr-_-GoogleMapsCZ-_-cp-_-prgcs] describes its architecture as Art Deco, it was actually constructed in 1952-4. 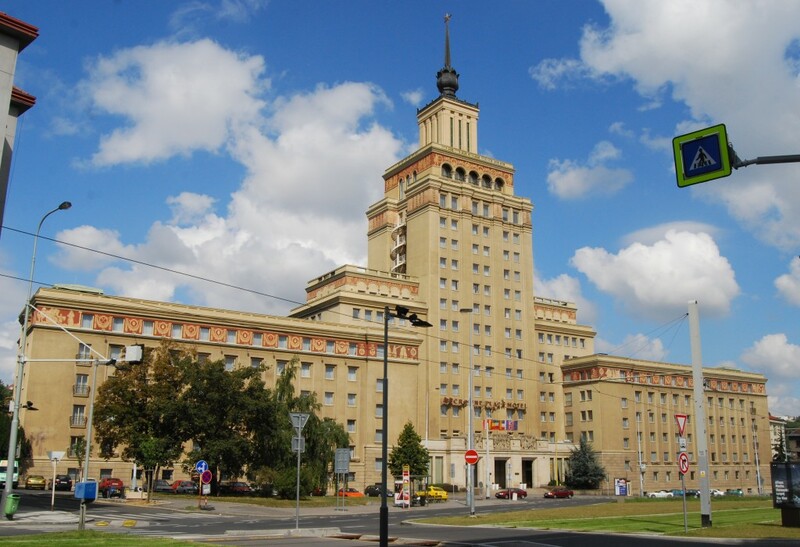 A Czech website describes the style as “an original combination of the architecture of Socialist Reali known as Sorela, and art-deco of the American type, completed by Czech artists and craftsmen”: http://www.visitprague.cz/en/hotels/crowne-plaza-hotel-prague.html. The room-rates aren’t at all bad: I could stay there. This entry was posted in Exploring Prague on January 16, 2014 by Mike Higginbottom. A random tram journey through suburban Prague on route 5 took me to Stromovka, where I jumped off out of sheer curiosity to find out what on earth was a grandiose building which turned out to be the Industrial Palace of the 1891 exhibition: http://www.prague-guide.co.uk/articles/the-exhibition-ground-and-stromovka-park.html. The huge expanse around it was virtually deserted. 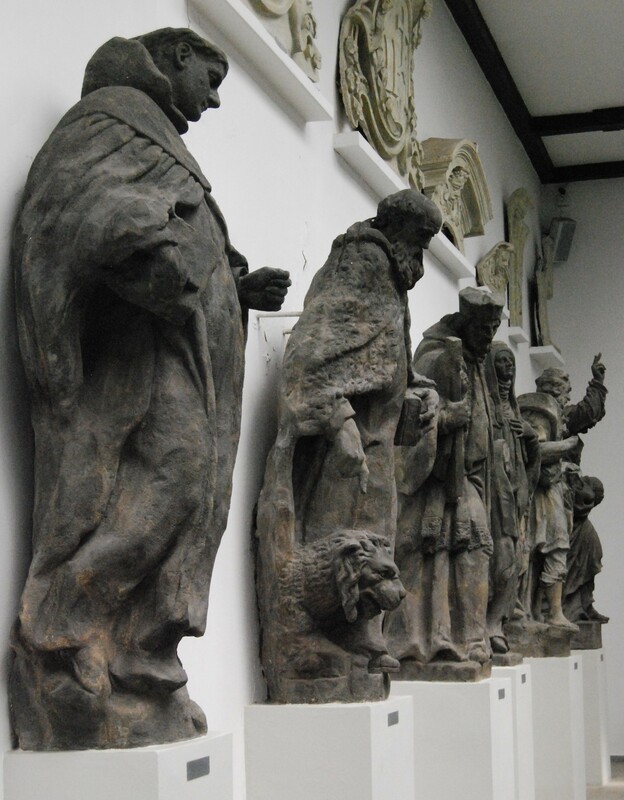 One building which looked semi-derelict but open turned out to be the Lapidarium [http://www.prague-guide.co.uk/articles/lapidarium—branch-of-national-gallery.html], the Czech National Gallery’s home for old statues. Here is gathered a plethora of baroque saints and bishops waving their arms about and carrying on – or as my mother would have said “showing off”. The baroque style is essentially theatrical, so the figures which adorn church interiors, rooftops and the King Charles Bridge camp themselves silly. It’s a delightful experience to stroll among statues from nine centuries – the noisest, liveliest gathering of figures, totally silent and frozen in time. During my ramblings round Prague I found my way on to the Historická tramva, the “historic tram”, which charged off up the hairpin slope Chotkova and eventually ground its way into a tram depot at a place called Střešovice. 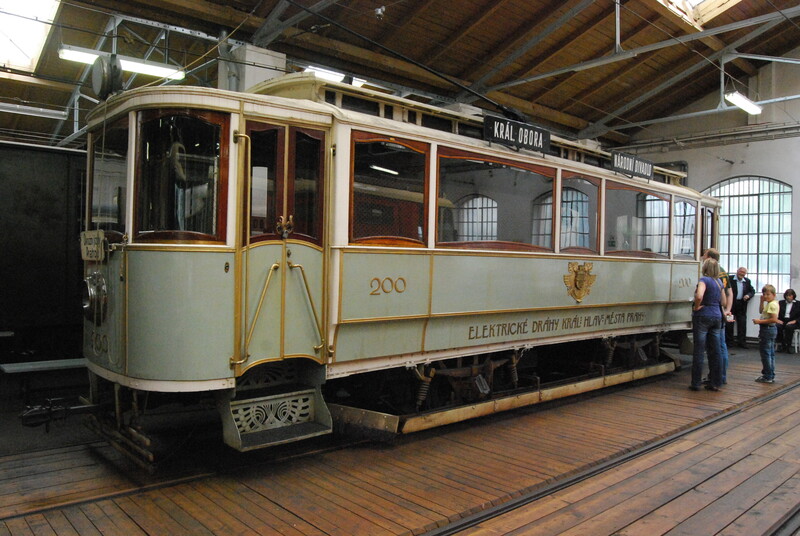 In the absence of anything else to do, I followed a desultory crowd to the far end of the track fan and found my way into the Prague Tramway Museum, which for a little over £1 displays dozens of trams, trolleybuses, motorbuses and associated paraphernalia in immaculate condition: http://www.dpp.cz/en/urban-mass-transit-museum. This is no work-in-progress like the Sydney Tramway Museum: it looks for all the world as if they could run a historic fleet of several dozen trams, but for the fact that there is another, operational historic fleet at the other end of the depot. The most endearing of these antique vehicles was the Mayor’s Tram, no 200, designed by the leading Art Noveau architect Jan Kotěra (1871-1923) and built by the Ringhoffer Company in 1900. Its headlamps are garlanded with delicately moulded metal leaves, and its interior consists of comfortable chairs and occasional tables, designed for the city councillors to meet and converse while riding in state through the streets. When new it was exhibited at the Paris World Exhibition, and subsequently carried every mayor of Prague until 1951. Thereafter it became a transport for nursery schoolchildren until it was acquired by the Tramway Museum after it opened in 1993: http://www.praha.eu/jnp/en/past_future/history_of_prague/one_of_the_oldest_trams_still_operating.html. This entry was posted in Exploring Prague, Transports of Delight on January 16, 2014 by Mike Higginbottom. When I first visited Prague I had a flashback moment in the taxi from the airport. My antennae twitch when I see tram-tracks, not only because my parents taught me to read (in block capitals) and count (in Gills Sans) by means of the trams running past our house in the late 1940s, but also because whenever we left Sheffield by road or rail our return was always marked by a competition to see who could first see a cream-and-blue Sheffield tram or bus. And there were, in my early childhood, rather more trams than buses on the streets. So when I first spotted a red-and-cream Prague tram (or trams – they mostly seem to run as attached pairs), I had a flashback to 1968, when the Crich tramway museum hit the national headlines because an antique Prague tram, with its minders, narrowly escaped the Soviet army arriving to extinguish Alexander Dubček’s Prague Spring: http://www.flickr.com/photos/45777493@N06/6036451806. Prague is in fact a tram city, rather like Melbourne. Most major streets have tram-tracks and there are services twenty-four hours a day. A twenty-four-hour travel pass costs the equivalent of just over £3. From my hotel near the metro-station I P Pavolva (named after a Russian physiologist), I found the 22 tram invaluable. It crosses the river, threads its way through the Old Town (passing at one point through a tiny arch you would think twice about driving a bus through) and climbs hairpin bends up Chotkova to the level of the Castle (and returns with suitable caution down the slippery slope). But I also made a point, as I do still with London buses, of hopping on and off at random simply to see the city unfold before me. By that means I learnt my way round Prague without a guidebook, and found some remarkable and unexpected places. This entry was posted in Exploring Prague, Life-enhancing experiences, Transports of Delight on January 16, 2014 by Mike Higginbottom. There’s plenty to eat in Prague. On the night I arrived I ate at the charming and comfortable Restaurant Benada, next door to the Clarion Hotel [http://www.clarionhotelpraguecity.com/restaurant_bar], where I sat on the veranda overlooking the park, dodging the raindrops, to eat veal ossobuco with a glass of representative Czech beer and a cappuccino. The best lunch I found in the city was round the corner from the Cathedral of St Vitus, the Vikárka Restaurant [http://vikarka.cz/en], which would be extremely cosy on a cold day, and provides a veranda with people-watching opportunities in good weather. I had a classic beef goulash [guláš] and another glass of generic Czech beer. Most evocative of all was Café Slavia [http://www.cafeslavia.cz/index.php?id_page=uvod&id_rest=slavia&id_lang=en] opened in 1881, the same year as the National Theatre across the road, remodelled in the 1930s, the regular haunt of the dissident playwright Václav Havel in the years before he became president. The first dinner I had there was a steak of Norwegian salmon roasted in ham with spinach roll strudel and horseradish aioli. It was memorable, with a large glass of Budweiser. The following night I grabbed the very best window seat, looking over the Vltava River to the Castle and St Vitus’ Cathedral as the sunset faded and the lights came up. I ate beef broth with meat dumplings, pork tenderlion coated with almond breadcrumbs with a potato salad that included a significant proportion of gherkins, accompanied by another large glass of Budweiser. I treated myself to a blueberry sponge-cake and a cappuccino. This entry was posted in Exploring Prague, Life-enhancing experiences on January 16, 2014 by Mike Higginbottom.